There are tracks in the snow. Butler is announcing that Farmer Fred is going cross country skiing. 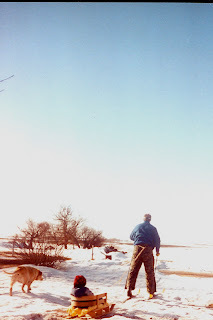 Cross Country Skiing has been a favorite exercise of Farmer Fred all of his adult life. The equipment is relatively inexpensive and long lasting, especially if you are willing to wear your everyday winter coverall rather than buying cute outfits. In GriggsDakota we have at least three months of great ski snow. Farmer Fred has skied in temperatures well below zero by carefully choosing his route near shelter belts close to home. Before his children were old enough to ski, Farmer Fred tied a rope around his waist and gave them sled rides. I can't find a photo of it, but there were times when he had one in a backpack, and two on sleds behind him. Going skiing with Dad was a childhood highlight! 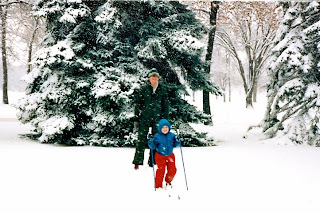 The whole family learned to cross country ski and we have enjoyed countless outings, always near home. Cross country skiing burns more calories per minute than most indoor exercise, because the body must also use energy to heat the air you breathe. The prairie is a beautiful place to ski on a sunny afternoon or a moonlit evening.